Making lasagna has never been easier! 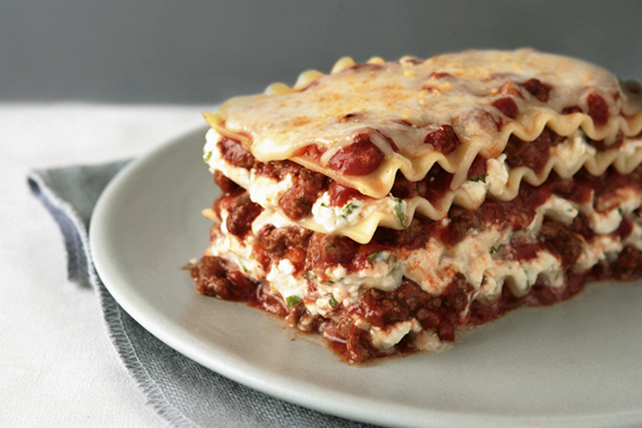 Spread 1 cup meat sauce onto bottom of 13x9-inch baking dish; top with layers of 3 lasagna noodles, 1/3 of the ricotta mixture and 1 cup meat sauce. Repeat layers twice. Top with remaining noodles and meat sauce. Sprinkle with remaining mozzarella and Parmesan. Cover with foil sprayed with cooking spray. Bake 1 hour or until heated through, uncovering after 45 min. Let stand 15 min. before cutting to serve. Serve with a crisp green salad tossed with Kraft Calorie-Wise Zesty Italian Dressing. The foil is sprayed with cooking spray before using to cover the lasagna to help prevent it from sticking to the melted cheese. Placing a layer of sauce under the first layer of noodles will help prevent the noodles from sticking to the bottom of the baking dish. Adding water to the sauce helps cook traditional noodles during baking, so you don't have to cook them beforehand. This saves you 15 to 20 minutes of prep time. The noodles will expand during baking to fill the baking dish. Substitute 1 pkg. (300 g) frozen chopped spinach for the browned ground beef. Thaw spinach; squeeze out excess liquid. Prepare as directed, covering each ricotta layer with 1/3 of the spinach.